The worst feeling in the world is when you want to help your children, but you aren’t quite sure how. Or you try everything and nothing works. P’Diddy has an awful chest congestion that is not going away. It is something I’ve never seen before. He has random coughing fits, especially when he is sleeping or outside running around. People are saying asthma, but I’m not going to go there yet. I’m thinking chest-cold that won’t go away. I was beyond grateful when Crane wanted to partner with me for a cool mist humidifier. And the All Aboard Train no less! You remember his Dinosaur Train room? This wasn’t just a humidifier, but part of the decor! I’ll show you in a minute, but this was the picture I took five minutes after it arrived at my door in my living room where I first set it up. I showed it off on Instagram because I thought it was SO cool! Yes cooool mist. hee hee. Yes the smoke stack is where the mist comes out ~ and it has a light on front! VERY FUN! Having a cool mist humidifer is one way we are trying to beat this congestion…naturally. It helps with colds, coughs, dry skin, and even those pesty nose bleeds that seem to stick around for the Winter for some people. I fill it up once each night and it works through the night and for nap the next day. I’ve even had it running in our family room while he plays. Need to keep moisture in the air! I don’t have to worry about it using up my electric bill because it uses less energy than a standard household light bulb. Did I say how quiet it was? Won’t disturb P’Diddy’s sleep! 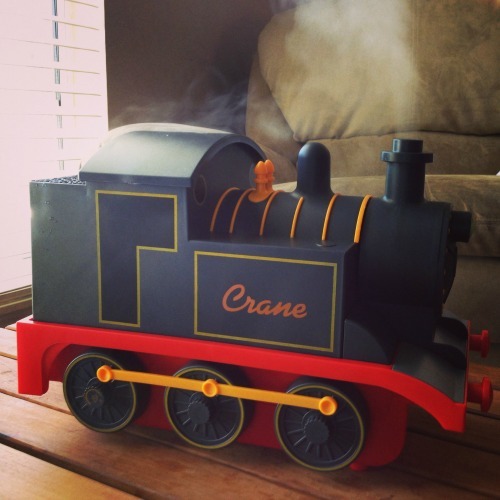 WIN any Adorable or Drop Humidifier from Crane! I recieved this item for review and all opinions are 100% my own. The giveaway will end on April 9, 2014 at midnight EST. Winners will be drawn via rafflecopter. Once a winner is drawn I will contact them and they will have 48 hours to reply before I draw a new winner. Giveaway is open to anyone in the US and you must be 18 years of age or older. Giveaway not affiliated with Facebook & I release them of liability. Winner will be posted in the rafflecopter widget. The train one is super cute, I would probably get the HELLO KITTY COOL MIST HUMIDIFIER! Little Sister C would love this! The cow and the monkey are sure cute! I have an old big monster humidifier and should probably replace it. Not currently using one. Love the Frog Prince - they are all so cute! This is so cute. I also like Cocoa the Dog. Yes we could use a humidifier at our place. They have the cutest selection for a child's room. I could really use a cool mist humidifier. My son loves trains so he would love this. The panda is so cute. I like the Blue Drop Cool Mist Humidifier. I need one for my daughters room. She would love to have the duck. This would be great for my daughter's room; I love the perfect house cat! I DO need a humidifier in my sons room and he happens to be my train lover. And how funny is it that he has those same Dinosaur Train decals in his room! The train humidifier is adorable! My 3.5 year old would love it & they help so so much! My son would absolutely love the train humidifier! I like Oscar the Owl! Well it would have to be the train one for me. LOL...my 3yr old son said today to me that he used to work on those trains??! My little grandson started preschool and seems to get sick a lot this year so this humidifier would work great to make him feel better. He would be thrilled with the Train theme humidifier! Yes I'd like a cool mist humifier to give to my grandchildren. I'd choose the train because that's what they would prefer. We have HK and the frog, wanting an elephant for the new baby! We don't own a humidifier at all, but with two boys I def need one! I love the train for my Gboys! They all 3 sick and on breathing treatments! The lil baby is in the hospital again! Yes, we could really use one of these...or a couple! My kids love the train and the penguin! Thank you for the giveaway!! Yes, I do need a new humidifier, mine is ancient. I love Oscar the Owl! I like the duck one. I like the hippo... always nice to have during dry winters. Oh yes, I could really use one of these, my sinuses are infected from all the dry heat and this non-stop winter! I love the train one too, it's adorable. Could definitely use one of these at my place. Love the WHITE DROP COOL MIST HUMIDIFIER. I need one of these and my boys would love this one!! My daughter needs a new one in her room! My daughter has had a runny nose all winter. I LOVE the train and hope a humidifier would provide her some relief. She currently sounds like Darth Vader! This is such a cute humidifier! My son is a big fan of trains and would love this! I am not picky on the model. A humidifier in my bedroom would help out in the Summer. I like the hello kitty one and with dry winters here it would be great to win this. Yes we need a humidifier at my house. I love the pure style drop humidifier. Really need one! Love the train & the owl! I love the elephant crane! They have so many cute ones to choose from. I would want one just for myself! YES!! I would LOVE to win this!! My son would love the train design! I also think the Red Dragon is really cute. OSCAR THE OWL is my favorite of the styles. I certainly am needing a cool mist humidifier. For myself! Right now I have the 2nd sinus infection in 3 months, and I am miserable. I would choose the Adorable Hello Kitty one, because just looking at it makes me happy). HAVING it would help me breathe. Thanks for the chance to win! We would love to win this!! I have all three my boys in one room and this would fit right in! With a new baby on the way, I totally need one of these and the train will be great for our lil boy! We have a warm mist humidifier not a cool mist one. I like the Germ Defense digital humidifier. We have one in our newborn's room. I would like to have one in our room as well. I like ELLIOT THE ELEPHANT"
I love the Crane cool mist humidifiers. We had a frog one but it isn't working right now because I dropped it as I was going down the steps. With asthma and allergies we need to run a cool mist humidifier a lot. I like the rejuvenating elegance. I have been really needing a humidifier. Whats the difference between the cool mist and warm steam? We need a humidifier in our home badly.My grandson lives with us and he always has a stuffy nose and dry itchy skin.He would love this because he loves trains. I always thought the animal ones are cute. My nephew would LOVE the train though. Yes we need one. I like the Hello Kitty! i would like one for my daughter who suffer from severe astma and allergies. I would like one as the winter air and elevated heater use leaves the family dry and vulnerable to allergies! My daughter needs one and my grandson loves trains! Thanks for the chance! This would be great for my allergies. Two sick boys and one sick mother - all stuffed up! We sure could use a train! We currently don't have a humidifier so winning one would be awesome! I need one for my little guy! He is a big fan of trains too! I absolutely need a humidifier, mine is very old and almost worn out. Oh I would love one for Carters room! He would love the train! Our house seems to get so dry, this would really help! Yes we need one! The train is so cute! I would love to use a humidifier as we have our gas fireplace going a lot and the air is so dry! I absolutely adore the Go Bananas for Humidity (monkey) humidifier. This would be cute for the home. I child would go cuckoo over this! I love the owl!!! and yeah we really do need a humidifier in our bedroom. the babies get so stuffy! My boys love trains!! They would be so delighted if we goat an All Aboard Train. The Penguin or the drops are my pick... yellow or something cheery! Usually the times you need the mists are when your feeling down and under the weather so something cute to cheer you up would be nice! I need a cool mist humidifier in my room, and the tiger one would be great! This would be perfect for my train obsessed little boy! I love the Crane Cool Mist Humidifier Train! Adorable and awesome for when my nine grandchildren are at my house Monday thru Friday! I loooove the train. My sons would love it. I want a tear drop for my room. The Cranes get the best reviews, so I bought one as a wedding gift for a friend, but I I think my family needs some too. That train is adorable! I want a blue or orange teardrop for my room, I sleep much better during allergy season with a humidifier. We use humidifiers constantly and could really use another one for my kids rooms. The train is adorable....love the owl too! I would love this for my children. We could really use this. We definitely need a cool mist humidifier in our house - our whole-house humidifier really isn't as effective as I'd like it to be. My son would absolutely LOVE this train one! We're always in need of a humidifier here at home, I've been boiling water lately to help lately. I'm a huge fan of the MERLIN THE RED DRAGON humidifier. We do need a humidifier, and I love the selection at Crane's. Is it wrong that at my age, I'd love to have their "Elliot The Elephant" Cool Mist Humidifier? It's so stinkin cute! Omg my son would LOVE the choo choo train!! I need one, my allergies are horrible and combined with the dry desert air I am a mess! I do need a humidifier. A 'friend' borrowed mine and somehow it never found its way back to me. Yes, I've always wondered if the benefits of a humidifier could help our breathing problems. I really like Merlin the Red Dragon Adorable for my daughter. She would love it. I can definitely use a cool mist humidifier in my home. All of the Crane ones are super cool. Lot's of cool designs. The drop ones are neat but I'd have to go with Puffington the Penguin. We do need a humidifier, ours broke!! They are all so cute but I really like the owl one! We sure could use one of these since we've been sick and stuffed up a whole lot lately. I love the Elephant one! We could really use one in my house! I really like the hello kitty one! i so like them all they are all so cute i think we would all love to have the bright yellow duck crane, very cool they use less energy than a light bulb, i didn't know that. thats my winning defense for the hubby,lol. I am in need of a cool mist humidifer at my home. I suffer from allergies, as do a couple of my children. We could all use humidity in our rooms at night. 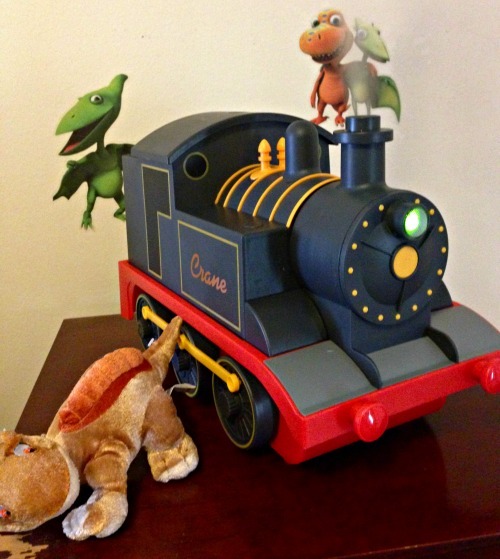 I love the train from Crane but my favorite is the "Oscar The Owl" Cool Mist Humidifier. I need one bad...last one died a slow long death after four years! I love the shark but realize that is purifier...I also love the owl! We really do need one! I am torn between the hippo one for my hippo obsessed daughter or the train for my train obsessed baby boy! 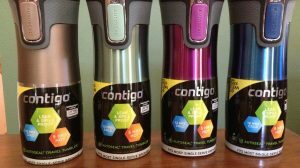 I have been looking for a good humidifier but they are all so much! I would love to win this for my son! i could definitely use one. and i LOVE the train! This so cute I liked for my baby 2 years old love this train a lot and always likes playing with them. i need one, and I love Cocoa the Dog. I love their Puffington the Penguin humidifier. Would love the train for my grandson who just got over the Croup. This would be so good for him! Thanks! We can really use one. Our house stays so dry all the time! Yes, we need a humidifier because the Arizona air is so dry. I like the Health, happiness, humidity one. Used Vicks humidifier for one winter season. Horrible design. I love the train design and so easy to deal with the water fill ups and clean ups. THe Vicks design was horrible in filling it up, it was so heavy it would pinch your finger. The train is our fav! !